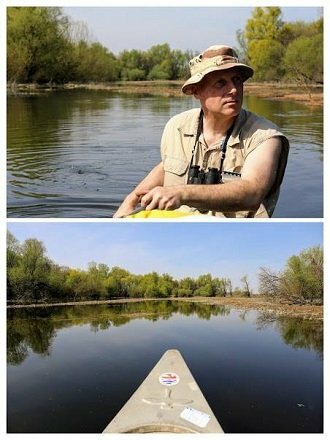 As you know, I started to bird from a canoe, exploring the Danube backwaters in Belgrade, Serbia. Those foreland backwaters stretch all along the left/northern bank, between the river and the levee, in some places only 450 m / 1500 ft wide, but elsewhere reaching even 2100 m / 7000 ft. 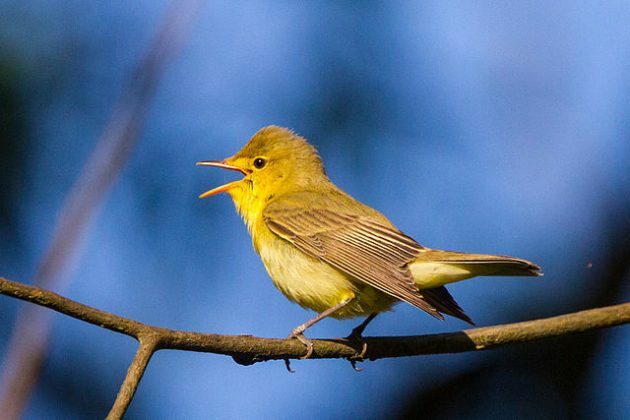 It is a fascinating world of swampy forests of willow and poplar, inhabited by Black Storks, White-tailed Eagles, Eastern Olivaceous and Icterine Warblers (above), among more than 200 other species. Backwaters are a hard place to explore. When inundated, in spring, it is exciting to paddle through the trees, yet birds that often forage on the ground will be pushed away. 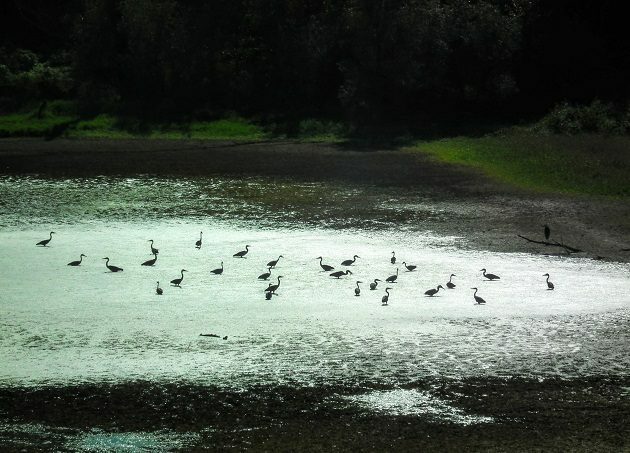 In early summer, when no longer flooded, it is usually still muddy with large puddles, perfect for birds but practically second to impossible to get into. When mostly dry, in late summer, birds are still there, especially songbird flocks fattening themselves prior to the migration, but thorny bushes of blackberries, combined with vines and lianas, as well as alien yet invasive desert false indigo thickets make approach on foot far from easy. Of those birds, eBird tells me that I observed 177 species, while Belgrade eBirders together have recorded 205. 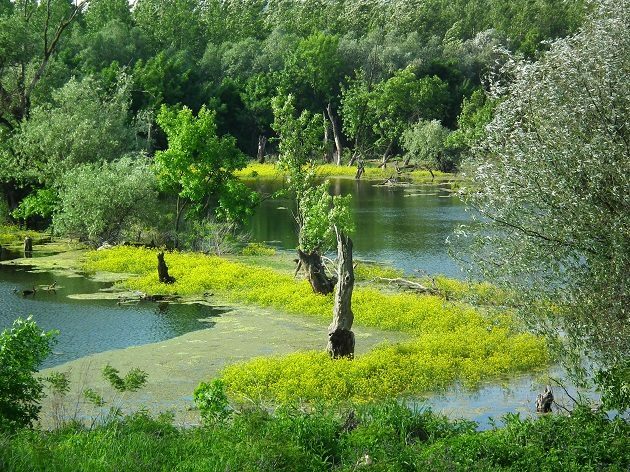 Perhaps the best example of such habitats may be the Central Beljarica floodplain hotspot. 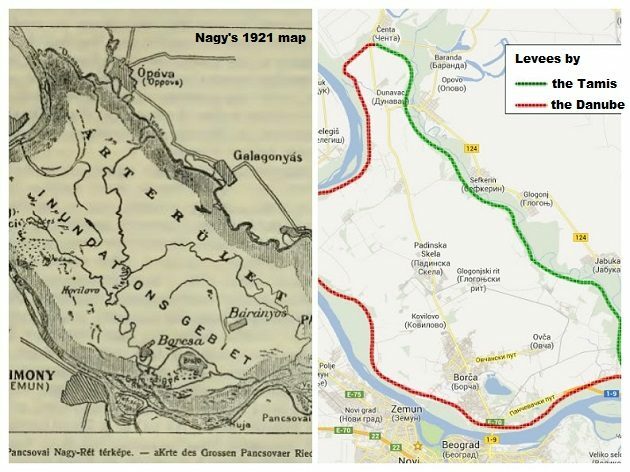 The backwaters of today are a part of once large floodplain of the Danube and the Tamis rivers, an area of 400 km2 / 155 mi2 that was inundated annually until the 89 km / 55 mi of levees were built in the 1929-1933 period. The levees cut off most of the area, which was later turned into arable fields, but what remains of those wetlands – the forelands edging the Pancevacki rit area (literally, “wetlands next to the Pancevo town”) laying north of Belgrade – actually form one of the most important international ecological corridors, protruding along most of the Danube. I remember paddling through some thick November mist hanging low above the water, barely up the gunwales. Whenever I pushed my paddle lower, I had the impression that there is no water and that I paddle on and through the mist, timeless and eternal. What I have always missed there and still miss experiencing is the presence of the European Beaver. The last beaver in the area was killed ten miles to the east – near Pancevo around the year 1900, but, reintroduced some dozen years ago, there are some 150 of them in the country nowadays. Yet, I have never heard the splash of a beaver tail when it dives. What else was to be found in that waterworld? How did those primordial wetlands look like before I got to know them? Asking myself that question quarter of a century ago, I snooped through a collection of research papers in the Natural History Museum in Belgrade (before the Internet, I really had to go through papers) and found the “Ornithological Notes from the Pancevo Wetlands 1909-1917” by Dr Jeno Nagy. But, published in 1921 in Budapest, Hungary, it was written in Hungarian. It didn’t stop me, although I could understand only dates, some place names (many others have changed) and some bird names (the birds were mentioned by their scientific names and you can imagine how they have changed). But what do you write in your notebook? Locations, dates, species and numbers, right? Well, with some limitations, that much I could understand. Some time ago I found Lorand Vigh, an ornithologist and an ethnic Hungarian from northern Serbian town of Novi Sad who volunteered to translate Nagy’s paper. And after two decades I could read what he observed in my wetlands. Nagy starts with a description of the area, lamenting how such habitats already become rare in his time, and this area might, he was afraid, soon succumb to a planned network of canals. And that was the time when all 400 km2 were still open to annual rhythms of flooding and represented a famous waterbird hunting ground. Nevertheless, Nagy was right. E.g. he mentions the meandering river Vishelja – today merely a straightened canal of Vizelj. Among the common species, Nagy mentions the Corn Crake. This species was found in damp meadows, which are mostly gone, either drained, cut off from flooding by levees, or in forelands, overgrown by false indigo thickets. I haven’t found it here and the last time that I know of, it was heard in the area around the year 1990. Another of his regularly occurring species was the Glossy Ibis (he wrote that shepherds were eating them), nowadays a rarity. In July 1909 he was near an oak forest (not sure where it was) and had some 6 to 7 Black Kites above, but when he came closer, about 30 to 40 birds took flight. Nowadays this species is declining in Serbia and the biggest number I ever saw at once was 6 and that area most likely has the highest population density – 3 pairs – anywhere in the country. Yet another abundant species in his days was the European Turtle Dove, of which we lost about a quarter of population to hunting in this century alone – nowadays officially a threatened species in the IUCN Red List. I will stop with his observations and descriptions here – I am environmentally depressed enough already, even without them. Although now covering a much smaller, more disturbed and polluted area, his wetlands are still here, and most of his birds, too. In 2010 the League for Ornithological Action, a local NGO, initiated the protection of the Danube foreland, which was accepted by the authorities. The proposal to protect 1860 ha was sent to the City Assembly, which conveniently forgot about it in some dusty drawer. Why? China expressed its interest to build an 870 ha large “One road, one belt” river harbour within Beljarica – the very heart of the proposed reserve, with three breeding pairs of White-tailed Eagles, together with Black Storks and 98 other species recorded in the breeding period alone. And the Serbian Government opted to forget about the international ecological corridor and its responsibility to protect it. Still, the best wetland birding in Belgrade is to be found along the levees of the Pancevacki rit (red: along the Danube; green: along the Tamis River). All suburbs within the Pancevacki rit are serviced by Belgrade public transport, but from them, it may be 1 to 3 miles more to reach the levees. Many eBird hotspots lie along those levees, so you can easily pick up the better explored areas vs. those hardly known. Cycling and walking are encouraged, but driving along the levees is not allowed.